These split systems have become very popular in recent years. They allow the owner to convert to a water source heat pump system. The outside air condenser unit is replaced with a WSHP Exchanger completely designed to use the existing line-set. 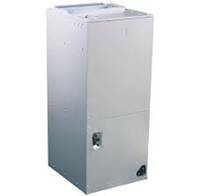 The air handler inside is replaced with an energy efficient variable speed unit. This could be called a retro-fit because the design still allows the existing Ducts to be used with out re-routing them. 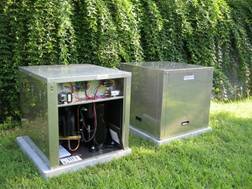 On New installation the owner can still have the Air Handler inside and the WSHP Exchanger placed in the garage or outside. Also available with a 2-Stage Compressor. Picture shows 2 outside WSHP Exchangers. These are self-contained. NO more noisy Hot Air Condensers!